Feeling a little like my mojo has gone in hiding...I turned to this weeks CPS sketch for some inspiration. 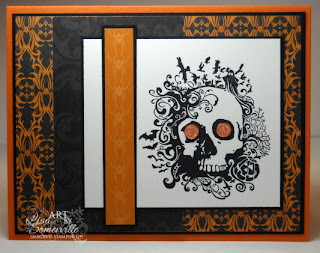 The skull image is from Stampin' Up! 's From the Crypt Set, stamped in Black. I had really wanted to stamp the spiders from this same set and have them going up the side, in place of the Cast-a-Spell DSP panel, but cutting those darn legs out was next to impossible. As soon as I'd get to the last one, I'd cut his leg off! Wanting to have that spooky glow to his eyes, and not having any Orange Glitter, I punched a 1/4" circle from Orange card stock, adhered a Glue Dot and added some Dazzling Diamonds Glitter. This is soooo cool! Gorgeous (or something!) stamp! Love the eyes! OMGoodness, I love it!! I can't wait for Halloween!! this is a really cool card! That stamp rocks! Love it! What a great stamp set! Ooh, I LOVE this! I'm really going to NEED this stamp set! Great card. Love the glittery eyeballs! This card is fantastic - I really like how you created the eyes - it's a very cool effect.